As a life-long resident of the Chicagoland area, Tina is no stranger to Brookfield Zoo. She has fond memories of visiting the zoo as a child and those memories sparked a keen interest in animals and conservation. A career as a zoo keeper was her goal for the future. 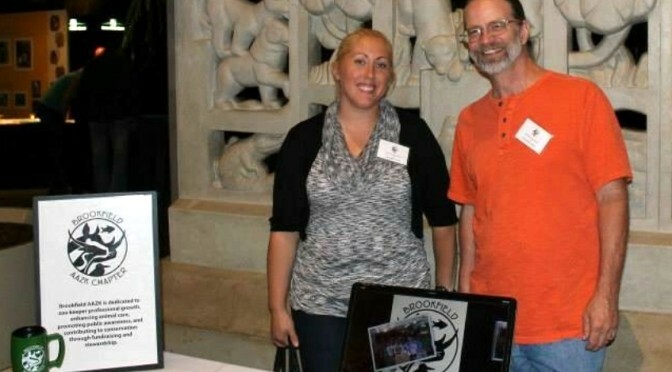 Upon earning a Bachelor of Science Degree in Biology from Saint Zavier University in Chicago, Tina pursued her career goal by applying to Brookfield Zoo where she started as an intern in 2006 at The Living Coast. After her internship she landed a seasonal keeper position that was split between the Butterflies exhibit and the Children’s Zoo. As her career continued to blossom she held Seasonal and Keeper Aide positions at Zoo Nutrition Services, Living Coast, Fragile Kingdom and the Pachyderm House. This wide base of work experience and knowledge served her well and she is currently a Senior Keeper for the Carnivore Department which includes The Fragile Rainforest, The Fragile Desert, Big Cats, and Great Bear Wilderness. Knowing how extremely competitive the zoo keeping field can be, Tina is continuing her education in her chosen profession. She is currently working on her Master Degree in Zoology and will graduate in December 2014. The program is called the Advanced Inquiry Program and is offered through Miami University of Ohio and all of her classes are held at Brookfield Zoo. 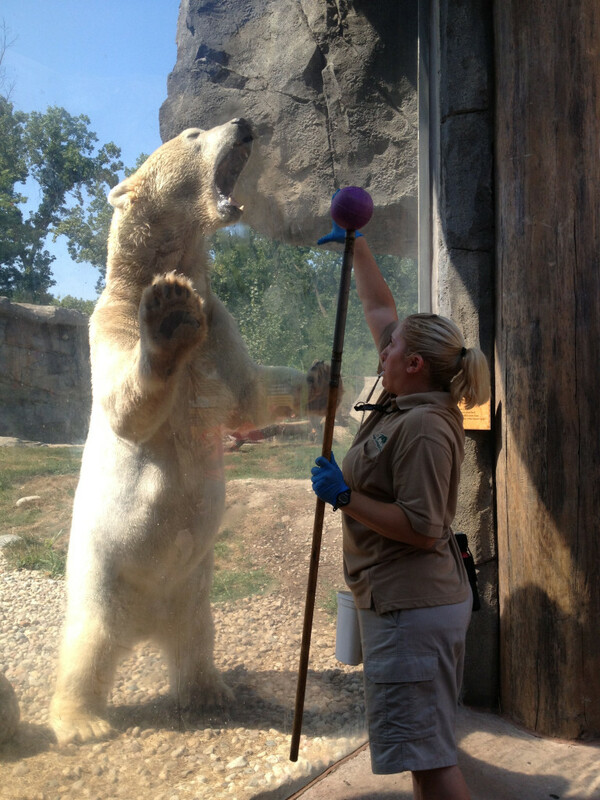 Tina feels lucky to hold her current position at the zoo because she loves what she does. She knows the importance of conservation of all animals and is proud to be a part of the daily care taking of the zoo’s animal ambassador’s to ensure the future preservation of their entire species. The animals daily care involves, feeding, health care, providing enrichment, medical attention, caring for young, training and much more. Every aspect of the job can be physically demanding, involve hard work, long hours, and sometimes just plain getting dirty. However, the good outweighs the not so good. “Seeing all the animals thrive and be excited to greet you every morning makes it all worth it”. Tina has been an AAZK member of a number of years. She learned of the Brookfield AAZK chapter when she worked with other keepers at the zoo that were involved with the group. “They loved the work the chapter did and seemed truly happy being involved with them”. She became active in the Brookfield Chapter in January of 2013 and is now the Board Secretary. Being an officer allows her to be involved in a way that can work hand in hand with the other commitments in her life. Even though she cannot always make it to every event, being on the board allows her the flexibility to help plan meetings and provide support to the group around her own schedule. 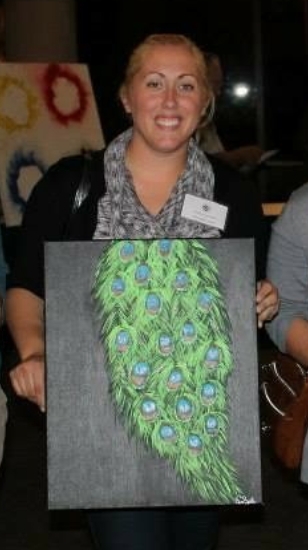 The Brookfield AAZK Art Auction is Tina’s favorite event. This year that event will take place on November 14, 2014 in Discovery Center at Brookfield Zoo. The Cross River Gorilla Project is the beneficiary of this affair. Art from talented humans and many of the zoo’s animal ambassadors will be on display and available for purchase. Browsing interesting art and drinking wine . . . Tina cannot imagine anything better. Well maybe one thing might top the Art Fair . . . a fun soccer game featuring one of her five children. She is the consummate “soccer mom” chauffeuring her brood to travel soccer games around the area. Tina and her husband spend the majority of their free time enjoying life with their active family which includes a brand new baby boy born in May 2014. If she ever does get time to relax (which appears highly unlikely) Tina loves to read!